This beautiful arrow is a spot-on copy of one of a set of Sioux (Lakota) arrows that were collected off the northern Plains in the late 1800's and are now in the collections of the Smithsonian Institution in Washington D.C. This arrow copies the originals in every respect. The shaft is made of dogwood, as was the original. 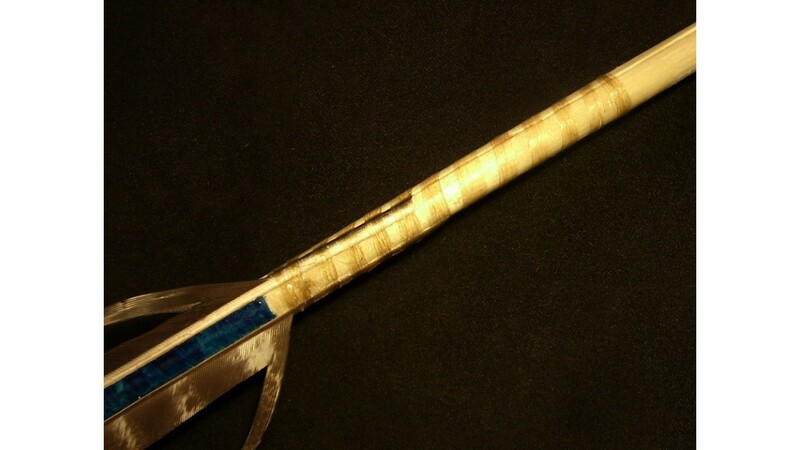 It has 3 shaft grooves that begin at the forward fletch wrap and stop just short of the point. 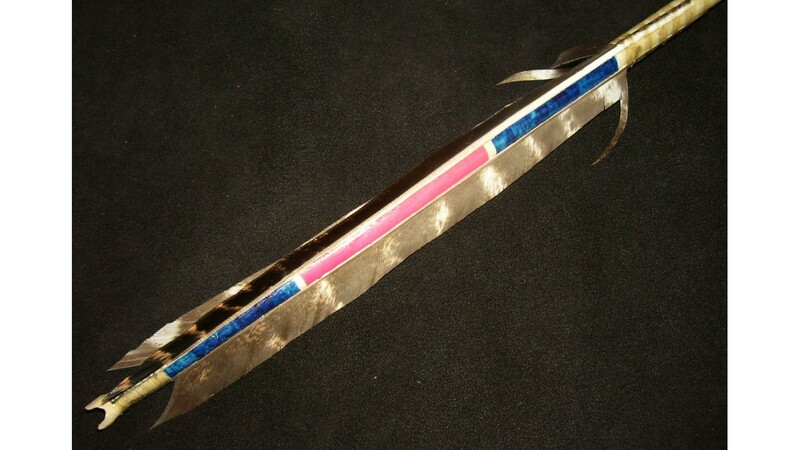 It's fletched with a mix of turkey wing and one turkey tail feather (Plains warriors often mixed different feather types on a single arrow). The feathers are secured on each end with sinew and the front sinew wrap is an open coil, which was very common trait on Sioux arrows I've examined. The front web of the feathers are left long, creating pretty "tails" that were present on the original arrows, and the feathers are glued to the shaft with hide glue (just as they were on the artifacts I saw). 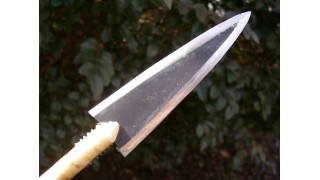 The metal point is made from a circular saw blade and it matches the points on the original arrows. The point is wrapped on with a sinew and then sealed with hide glue. 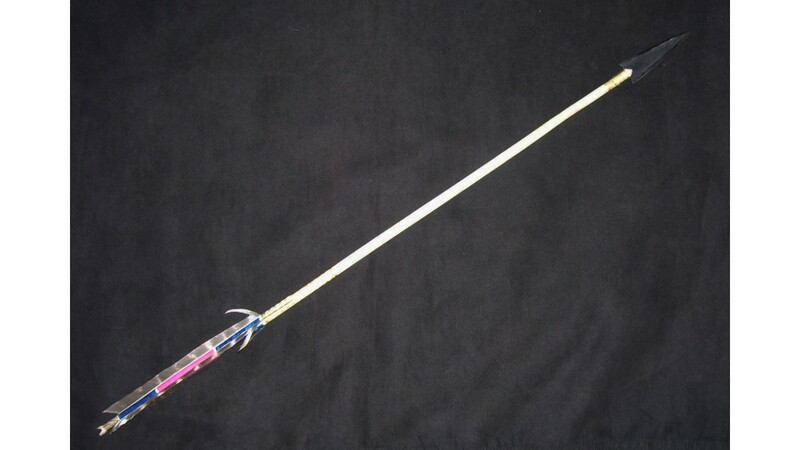 The paint design copies the one on the arrows and the nock is slightly flared, which gave the Plains warrior a better grip when the arrow was shot using the Pinch-grip. This arrow is shipped in a sturdy PVC pipe to ensure safe delivery to your door. Click photos for larger images. This arrow is a faithful copy of the original and is based on years of research in museums across the country. It's a stout, heavy missile that would have been shot from a short but powerful sinew backed bow. 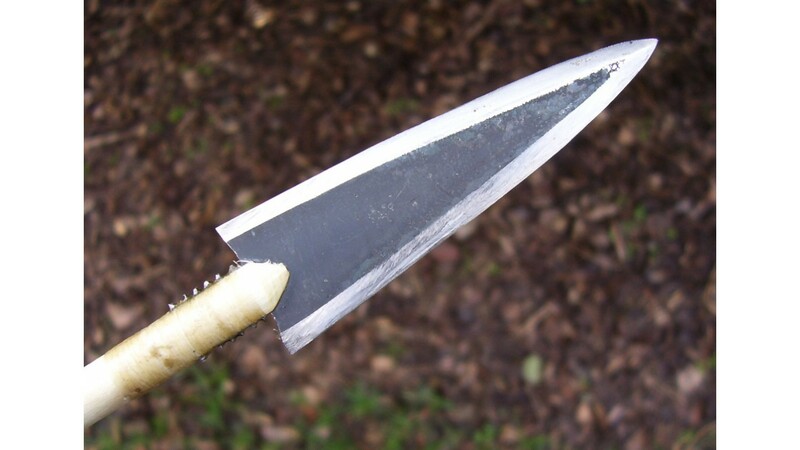 The stout metal point and heavy shaft would carry tremendous momentum at close range and would have undoubtedly inflicted a serious wound on an enemy or brought down a buffalo with one shot. Arrow Specs: Replica Sioux Arrow (circa 1870's), dogwood shoot, turkey wing and tail feather fletch, sinew wrappings, metal trade point made from circular saw blade. 26 1/16 inches long.